By Leigh Brown—The second annual Jewish Heritage Month is officially underway in Ontario, following its inauguration on Tuesday at the Lipa Green Centre for Jewish Community Services on Sherman Campus in Toronto. 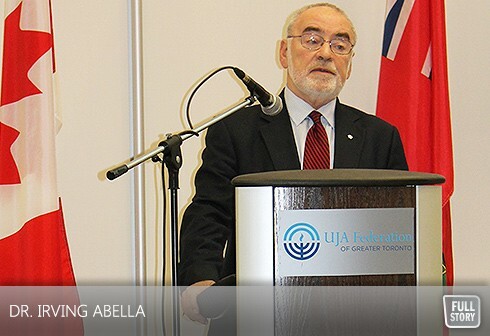 Over 100 people attended the opening celebration, sponsored by UJA Federation and its advocacy arm, The Centre for Israel and Jewish Affairs (CIJA), featuring keynote speaker, Dr. Irving Abella, renowned author and an expert on the history of Canadian Jewry. Watch a video from Opening Night The “Jewish Heritage Month Act” (Bill 17) - spearheaded by Liberal MPP Mike Colle (Eglinton-Lawrence) and co-sponsored by NDP MPP Cheri DiNovo (Parkdale–High Park) and Conservative MPP Peter Shurman (Thornhill) was passed unanimously in the Legislature on February 23, 2012. JHMO provides an opportunity to appreciate and learn about the history and culture of Ontarians of Jewish heritage who have made an impact in communities across the province, from Kenora to Cornwall. It also allows all Ontarians to share in acknowledging the significant contributions made by the Jewish community in the fields of medicine, law, politics, arts, business and philanthropy. MPPs Colle and Shurman were in attendance at Tuesday’s event while MPP DiNovo, who was unable to attend, sent greetings. Tuesday night’s program also unveiled Being Jewish in Ontario: A Pictorial Celebration, a travelling photo exhibition in honour of Jewish Heritage Month, which explores the many different ways of “being Jewish” around the province, through photographs from UJA Federation’s Ontario Jewish Archives. By the end of the month, the exhibition, a UJA/CIJA initiative, will travel to 10 venues including public libraries, Jewish Community Centre’s, Toronto and Vaughan City Hall and Queen’s Park—raising awareness around Jewish Heritage across the GTA. For more information on Jewish Heritage month and for a listing of the Jewish Heritage Month activities, please visit www.jewishheritagemonth.ca.